Enjoy wood-fired pizza for 50 in Bella Luna’s warm and welcoming banquet room Includes 30 select pizzas and use of the room for 3 hours. Valid Sunday thru Thursday - redeem by May 2019. Your two-night stay at Rockwood Manor is just a short drive down I-81 to the New River Valley. Enjoy a Southern breakfast and a personalized copy of CAIRNAERIE, a historical novel by M.K.B. Graham. Unwind at Virginia’s best craft beer breweries, which may includeDevil’s Backbone Brewing Co., Blue Mountain Brewery, and others. Enjoy flights, appetizers, and swag! Transportation provided. Redeem by DECEMBER 16, 2018 (updated redemption date!). Hit the trail at Camp Horizons! Adults and children alike will enjoy the scenic ride, followed by a gourmet picnic prepared by chef extraordinaire – Tassie Pippert. Sept-Nov 2018 or March-May 2019. Your favorite princess will visit your party at the Children’s Museum! You’ll enjoy private access to the museum on a Sunday afternoon with tea, sandwiches, cupcakes, and decorations fit for a queen! 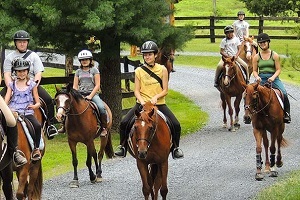 Saddle up for horseback fun with a Pony Party for ten guests at Camp Horizons. 2-hour session. Sept-Nov 2018 or March-May 2019. Experience a magical 3-night stay in a 2-bedroom suite at Marriot's Manor Club in Williamsburg with 4 tickets to Busch Garden's Christmas Town and Colonial Williamsburg. December 20-23, 2018. Two couples will check in to the Presidential Suite at Hotel Madison and take a Pedi-Cab downtown! Enjoy small plates paired with cocktails at Food.Bar.Food and Beyond, followed by drinks at Pale Fire (and entertainment if available). Savor Urgi's cheesesteaks during a private brewing session at Friendly Fermenter for 4-6 adults over 21. Then carry your homebrew to the next gathering with an engraved wooden beer holder. Enjoy cool evenings with the fire pit kit while gathering around the fire with friends and family. This durable outdoor centerpiece includes a mesh cover, cover lifting hook, log grate, and bowl. You get the hideaway for yourself and your friends! Room rental for 25 people for two hours in downtown’s speakeasy. $200 credit for food and drinks. Valid Sunday thru Wednesday - redeem by June 2019. $500 certificate includes maintenance and mulching, mowing, design, plant installation, hardscaping and garden water features.